Pardon my absence, but I had very important business to attend to — Wrenz and I were the entire Empire cheering section at a recent Jedi Training Academy at Disneyland. 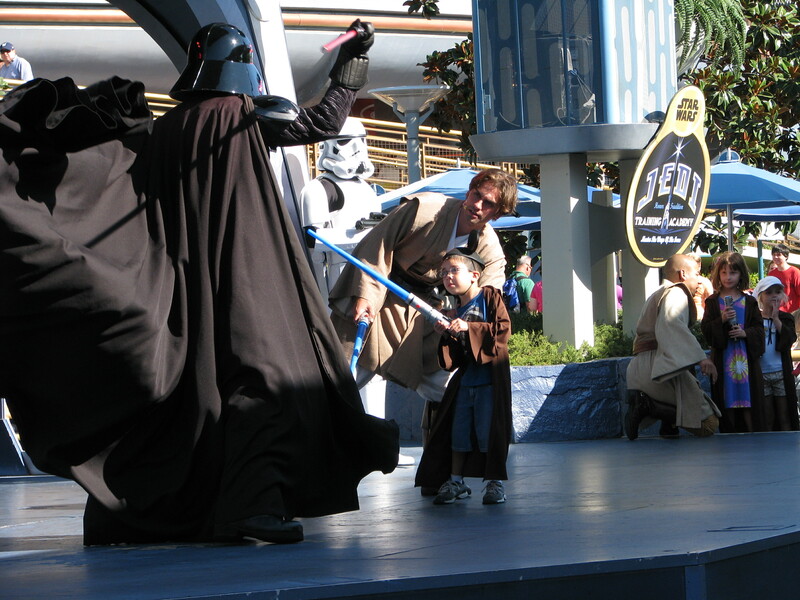 See above for the photographic evidence of Lord Vader giving a fledgling knight a little light saber action. And to all of you who got in to play this weekend, I am both happy for you and incredibly jealous. And I can’t wait to hear about it! The Eternity Vault Developer Walkthrough released late last week gave a good idea of what the raiding game play will feel like. And I have to say, I liked what I saw. Especially those adorable little heal bots flitting about healing players. So adorable! And have I mentioned recently just how anxious I am to be shooting out purpley lightning? Darth Hater is hosting a live Q&A tomorrow night. Great opportunity to pick the team’s brains about what they learned and played at PAX. Oh yeah– and they also filmed the final day’s PAX SWTOR panel. Ask a Jedi had a nice post on how the item modification system will allow RPers and other stylish players to retain the looks they want without sacrificing the power their character level allows. The most-recent TORWars podcast really brought me back down to earth with regard to the beta weekends. If there really are 1.5 million tester sign-ups, and only so many people can fit on a server, the odds of getting in just aren’t great. Sigh. We’ve still got early access for pre-orders, at least! I hear you on that. My one WoW BETA experience was thanks to having a friend who knew someone at Blizzard and had a few BETA codes to give out (for WOTLK) I did get into the SC2 BETA of my own accord, so that gives me hope that there is a small glimmer of a chance for the SWTOR BETA. I actually really like doing testing and writing in bug comments, especially since I always know that as a Mac user there are always fewer of us testing. Bioware did say though that they’re going to be sending out invites throughout the entire beta process. You might not get in on the first round of invites, but that doesn’t mean you won’t get in on the second or third. I would have liked getting an invite this week in particular with the holiday on Monday, but what’s a hopelessly hopeful gamer to do? Here’s to better luck for all in round 2! Crossing my fingers we both luck out!